It's actually 12 quarts of Castrol Edge 5w40, normally $9 a quart, got it for $6. Would have bought more but they didn't have any more in stock, haha. And the closest box they had was a motorcraft box. On a photoshoot for Low Down Labs, shooting a Solar Orange R8 Spyder, and got one of my photographers got one of my car, lol. Decided to submit a pic for a chance to win an air ride setup. Wednesday they will announce the 20 they pick, then it will go to votes, so keep an eye out, hopefully I'll make it! What did you use to make that lower lip? 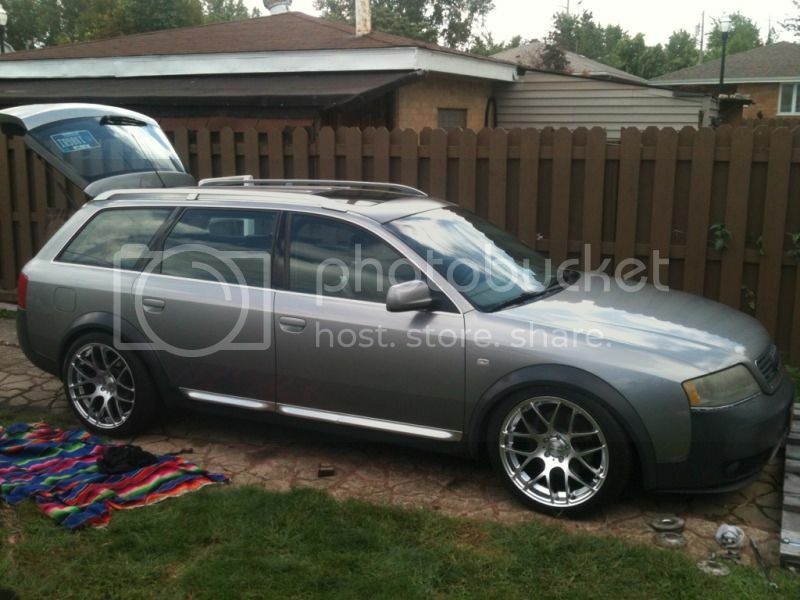 I have similar wheels on my Allroad, they are Avant Garde 19x9.5 all the way around, did you have to use any spacers? Ok, put a small spacer on the rear and tried to lower it EVEN MORE, but the spring perches were resting on the axles... so raised it up, actaully higher than it was. Figure it'll probably snow sometime, best get ready. Very nice example. Excellent choice with the wheels. I have the ST coilovers as well and yes it is that time of year again to raise them up a bit. Well, Crutchfield had a sale on the Pioneer AppRadio, which I've been wanting for a while, so decided to finally do it. Flush mounted, still has steering wheel controls. Has parking brake bypass. GPS antenna mounted inside dash. Phone mic on the steering column. I'm very happy with this purchase! That looks nice. One thing that's put me off getting a replacement screen has been all the bling and lights that modern manufacturers insist on adding to their head units.